Last year, Gaynor selected the social-emotional program, RULER, to be integrated into the curriculum. According to Understood.org, “Social-emotional learning (SEL) instruction helps kids learn how to cope with feelings, set goals, make decisions, and get along with others.” Since RULER’s launch, teachers in every Cluster are finding creative ways to incorporate it into their students’ lives. Keep reading to see how the program is being tailored for different age groups and needs. Race, religion, and LGBTQ issues are three of the main topics Rochelle Hoffman has been covering as part of lessons on civics and social activism. Each student created their own research report on famous activists, including Jackie Robinson, Ruby Bridges, and Nelson Mandela. Using their knowledge of the Mood Meter, students used it to identify how activists might have felt during certain periods in their lives. The ultimate goal is for students to be able to effectively identify their own energy levels, and then work on strategies to regulate it. 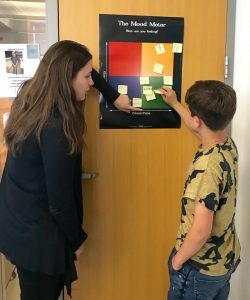 Using the Mood Meter ties into student advocacy, executive functioning, impulse control, and being able to identify triggers that make them feel certain feelings as well as balancing and regulating their own emotions. In Jacqueline Kolbert’s Orange Cluster class, the Mood Meter is as much a classroom fixture as the SMART board or books. 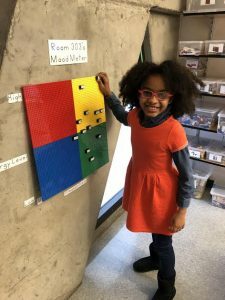 Prominently displayed in the center of the classroom and constructed out of Lego board, Ms. Kolbert’s Mood Meter makes it fun for students to express their moods. Each morning, after students unpack, they’re encouraged to place where they are, emotionally, within the four quadrants. “It is helpful for me to know how they’re feeling,” says Ms. Kolbert. If a student who needs extra help in reading is already feeling anxious at the beginning of the day, and the warm-up activity is reading, then Ms. Kolbert can be more aware of that. Her students are free to readjust the meter at any time if and when they feel it is necessary. On the surface, it could appear that introducing the Mood Meter to children ages 3-6 might be too complicated to do so effectively. For Hudson Room students, it took a tactile, multisensory approach including dance, art, photography, dance, and music. First, students thought about the Mood Meter energies and the physical response to specific emotions. 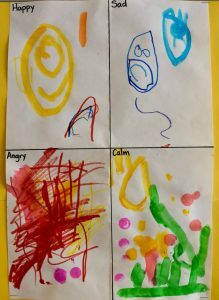 The Mood Meter was incorporated into body breaks during the day, an obstacle course in the classroom, and almost every morning students place which quadrant they were in on the attendance chart. Hudson Room students also do therapeutic art once per week. They painted watercolor Mood Meters, even taking care to correspond the brush strokes to the energy of the quadrant. In the Willow Room, they did a similar project but asked students to draw faces or simply use colors and intensity to match the right quadrants. To see RULER in action in Gaynor’s classrooms, go to bit.ly/facingemotion to see a mini-documentary which includes interviews with teachers and footage of students.